the land reclamation Board Veneto Orientale, from the current financial year has set a new “Piano di Classifica” (rating plan), in order to get the application of the tributes of Board. The new document has been drafted in accordance with the provisions of the relevant laws (R.D. 215/1933 and L.R. 12/2009), adopted by the Board by Assembly resolution n. 12/A-16 of 22.12.2016 and approved by the Regional Authority of Veneto with D.G.R. n. 1563 of 03.10.2017. The New Rating Plan has allowed to spread, by homogeneous methods, the costs of managing - maintenance, operation and monitoring - over the whole area of hydraulic works between all properties - land and buildings - which benefit of land reclamation activity and therefore fall within of the "perimeter of contributions": costs divided between buildings that benefit from rainwater drainage and hydraulic safety and, for agricultural lands only, that benefit from irrigation source. Must be underlined that in the Board system of works, appointed to the drains functions of rainwater (by gravity or mechanically) and to defence from the waters, there are 1.660 Km of canals, 500 km of embankments, 80 pumping plants with a total lifting capacity of 839 m3/s. Furthermore, must be highlighted that the Board guarantees an irrigable flow of 47.440 l/s. With the Payment Notice attached, we would like to inform you about the amount for the year 2017 of the land reclamation or irrigation contributions regarding your properties, calculated using the above-mentioned New Rating Plan. During the drafting of the Plan, has been paid attention to areas with permanent water stagnation conditions and to urban buildings equipped, including collectively, with hydraulic mitigation systems pursuant to DGR n. 2948/2009. For these kinds of properties there are expected reductions in the benefit index that decrease the amount of the reclamation contribute (for more information, consult the Board website in the "Piano di Classifica degli immobili" section). Also during the determination of the irrigation benefit, a technical-economic analysis allowed to identify, for each homogeneous area, the irrigation management costs spread on irrigation benefit index, which gives a measure of the advantages of land, obtained by each character soil, as a result of irrigation activities. The notice of payment it is sent as a form of kind payment and to all taxpayers enrolled in the tribute of the Board allowing cost savings related to notification required by the mandatory collection forms. The contribution of reclamation, it cannot be split up and must be paid for the entire annuity. It follows that the effects of changes of ownership occurred during the year, will take effect starting from the role of the following year. In the "Detail of the amounts due" and "list of properties subject to contribution" is a description of each contribution. To optimize the activities and collection costs, due to that the Board hold more than one position taxpayer, it posted a single remittance advice, bringing together the individual positions of the taxpayers first notice (recipient of the notice) based on the tax code while retaining the details of each location and descriptive documentation attached. All contributors are encouraged to check the land registry data, the header, the tax code and address. For the correction of any errors, please send copies of the documents, preferably by e-mail to the address catasto@bonificavenetorientale.it or in the following ways: directly at the Board Record office “Uffico Catasto” by regular mail to the headquarters of the Board Veneto Orientale. If received instances of update of properties features (documented surfaces in situations of hydraulic invariance, agronomic penalty, existence of requirements rural building or surfaces that are affected by changes in the irrigation system), or more generally of adjustment resulting from the introduction of the new classification criteria, made before the date of 30/12/2017, Board offices will be educated with any balance of the amount payable in 2017 by the role. The change request does not involve the automatic suspension of time limits for payment of the charge payable for the current year. Property changes will take effect from 2018 role. However, remains valid for the seller right of recourse by the purchaser for reclamation contributions paid after the sale. In the event of non-payment within the deadlines indicated activates the mandatory procedures provided for by DPR n. 602/1973 and subsequent modifications, and then notified payment folders with the burden of expenses and legal fees the mandatory collection. carefully indicating in the reason only the Notice Number (“Avviso di pagamento”) and the Personal Tax Code (“Codice fiscale”). 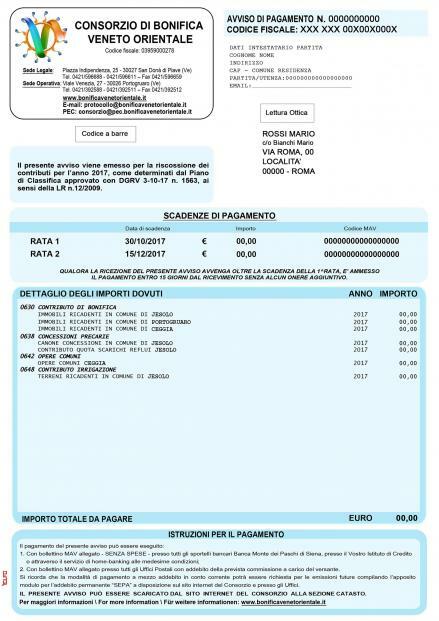 Associates wishing to receive the electronic payment directly to the e-mail address or Certified Electronic Mail can apply by filling out the form available on the website of the Board- www.bonificavenetorientale.it section “Catasto” and at the offices. It is useful to recall the possibility of activating direct debit bank account by completing and returning to the form which can be downloaded from the website or obtained from our Office. Please note also that reclamation contributions may be deductible expenses from the gross income reported for tax purposes, in accordance with art.10, a) of D.P.R. 917/1986 and resolution n.44/E of 4.7.2013. To this end, we encourage you to keep the entire Notice and the receipt of payment. Any appeal against the notice of payment, procedures errors, may be brought to the Board (art. 112 – R.D. 8.5.1904, n.368) within thirty days after the expiration (D.P.R. 24.11.1971, n.1199). Under the L 241/90 and following edits, we inform you that the head of the tax proceedings is the General Director Eng. Sergio Grego.